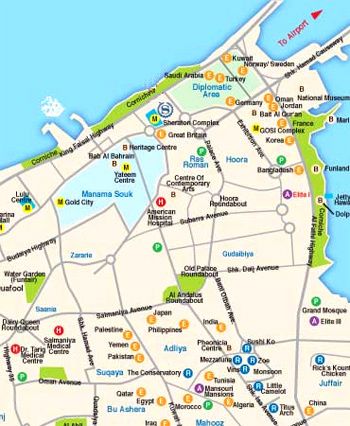 TBahrain is an archipelago of thirty three islands comprising a total land area exceeding 700 Sq.Kms. The name Bahrain is derived from two Arabic words “thnain Bahr” which means - two seas - and indicates the phenomenon of sweet water springs under the sea, which mingle with salty water. This oddity is presumed to be the reason behind the unique luster of the pearls found in Bahrain. These pearls were the major economic force for Bahrain before it switched to an oil economy. The main island of Bahrain was also riddled with many natural springs that helped to irrigate the northern and western regions that had fertile soil. The central regions of Bahrain are mostly limestone rock covered with saline sand where only desert vegetation can be found. The highest point in Bahrain is the Jabel Dukhan that stands at 134 meters above sea level. Most of Bahrain's oil wells are found in the vicinity of this general area. The highest point of Bahrain is the Jebel Dukhan, which is 134 meters above the sea level and the lowest point is the Persian Gulf. 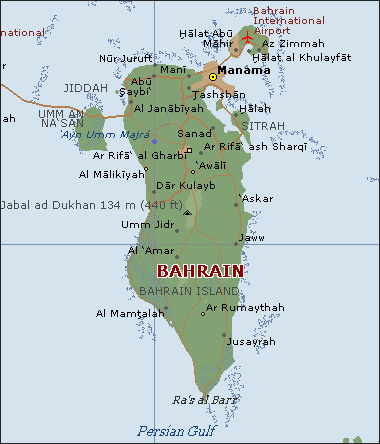 Bahrain lies in both eastern and northern hemispheres. It is positioned in the Middle East, a geographical region of Southwestern Asia. The island is located in the Persian Gulf, east of Saudi Arabia. Land Areas comprise one large and thirty smaller islands. Most of the main land comprises sandy plain, low-lying rocky, coastal salt marshes without any significant lakes or rivers.